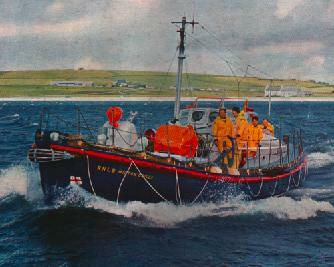 The Hilton Briggs was formerly on service in Aberdeen and was called in to serve Longhope until a new boat could be built, she was a 52 foot, Barnett class lifeboat. The newly appointed coxswain for Longhope was the former second coxswain from Stromness, Jack Leslie. Most of the service calls were for taking ill people across to Orkney mainland for hospital treatment though one call was to a fishing boat Morning Star which grounded just off the Calf of Flotta, the Kirkwall lifeboat also attended but the vessel was towed to the pier at St Margarets Hope.